Lincolnshire Veterans Ladies Golf Association. The first meeting was held at Woodhall Spa Golf Club on November 18th 1963 when 17 ladies were present. Please click the thumbnail image to the right to see a larger view of the first page. Mrs. Kath Bloomer was elected as Captain and Mrs. Nelson Vice Captain. Mrs. Kath Bloomer was a member of Grimsby Golf Club and was County Champion for many years from 1933. Grimsby were indeed fortunate to have had a ladies champion of such calibre, as a standard of golf and impeccable behaviour was set, upon which much has been built. Mrs. Bloomer was also elected to represent Lincolnshire on the Midlands committee. The Rules and Constitution of the Association were formed at this meeting. (see Appendix A). An Open Day was arranged, to be held at Holme Hall on May 14th to play a medal round with an entrance fee of 5/- (25p) and an optional sweep of 2/- (10p). 76 members played and at the Autumn Meeting held at Elsham on August 20th 78 members played. The first AGM of the Association was held at Woodhall Spa on 14th December 1964. 28 ladies present. The association now had a membership of 204 having grown from the original 17. Trophy’, as it is referred to in1966), be played for at the Spring Meeting over 18 holes. This cup had previously been played for over 36 holes at a County Meeting. Subscriptions were raised to 5/- (25p) in 1966 mainly so that prizes could be bought from funds, rather than having 'to beg'. At the second AGM it was decided to change the constitution, so that the officers should serve for one year only and not two. 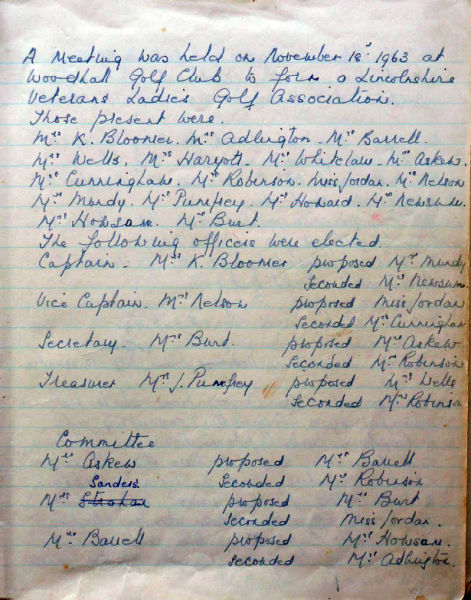 At a meeting at Louth Golf Club on Monday 14th March 1966 it was decided to become affiliated to the Midlands Veteran Association and the subscription of 2 guineas be sent with the individual subscription. At the October committee meeting it was suggested that all the fixtures are printed in a small booklet, this also acting as a receipt for the annual subscription. At the 3rd AGM in 1966 Mrs. Nelson offered to give a scratch trophy (best gross score) to be played for at the Spring meeting along with the Croft Baker Cup,( which was presented for the best nett score). The scratch trophy was two silver candlesticks. It was decided in this year, to challenge the rest of the County (county ladies team)? to a match the following year. At the Spring Meeting in 1967 the prizes were donated but at the Autumn Meeting they were paid for from funds. At the fifth AGM in November we had 202 members from 18 clubs in the County. It was decided that the future vice-captain should be chosen by the committee from the older members suitable to fulfil the position. It was also suggested that a further brooch be made for members who had played in three Veterans County matches. This brooch was to be chosen by the committee and be paid for by the recipients. 55 yrs., but at the AGM in Nov. 1971 it was decided to leave the age at 50yrs. until the Midland Vets. took the lead and changed their age limit. At the October committee meeting, the County President, Mrs. Joan Newsum offered to give the Association a cup to be Played for by members over 70 years of age. The cup was to be played for, possibly, at both meetings and known as the Seniors Cup. It was suggested that the names of the winners of the Trophies, which were played for at the two meetings, should be entered in our 'annual booklet' (fixture card). It was also agreed at this meeting that should a member wish to resign, as long as the resignation was put in writing, that she could re-join at a later date without paying the intervening subscriptions. At this time, £50 was donated to the newly formed County Junior Association. At a committee meeting in March 1971 both the Nelson Trophy and the Croft- Baker cup were to have bases made for them and silver discs applied so the winners names could be engraved. County and the other for the Vets. A rough estimate of £11:25 each was given, to be made in gold and green, one with a Lincoln Imp and the other, Lincoln Imp in a 'V' size 9' x 4'6"
and treasurer £10 each (presumably for expenses) . At the 8th AGM in November the new flag was presented to the Vets.Captain. The flag for the County had been presented at the County AGM earlier in the month. The membership was now 231. It was decided to arrange a luncheon to follow the AGM, in 1972. At the meeting in November this year a discussion took place regarding the areas which committee members represented and the clubs involved. Since this time committee members have served for two years from various parts of the county representing the clubs in their area. As they finish their term of office someone else from the same area is asked to take over. Over the years it has become more structured and the County is divided into 6 groups. Each group represents several clubs. Groups 1,3,and 5 are nominated in odd years and groups 2,4, and 6 in even years. At a committee meeting in March 1973 it was decided that Captains would be chosen for their suitability rather than long membership. At the 10th AGM in 1973 it was decided to play only one round of golf at the Spring Meeting so more ladies could play. ( previously it had been a 36 hole comp). The membership was now 237. It was reported at the 11th AGM that Derbyshire would no longer have a fixture against Lincs. This was very regrettable but the match this season had had to be cancelled because Derbyshire could not raise a team. Due to the fixture date being free it was decided to play against the County Senior men. As a result this became a permanent fixture. Also at this time it was agreed that match meals would be paid for from funds. The minimum age was raised from 50 to 55 yrs. in line with neighbouring counties. At the 12th AGM it was suggested that the team play in emerald green sweaters. Mrs. Joan Chaplin (retiring Captain) & Laura Bosworth ( incoming Captain) were discussing a trophy to be played for at the Autumn Meeting. It was to be 'The Chaplin Trophy' very pretty rose bowls, first played for in 1976. In this year there were 264 members. Mrs. Laura Bosworth presented to the Association a Lincoln Imp on a pedestal, a trophy to be played for at the Spring Meeting from 1977 by Past Captains of the Association. The winner of the Newsum Senior trophy, Mrs. Celia Wells donated silver bands to be fixed to the plinth. The death of Mrs.Croft-Baker occurred at the beginning of this year. In July 1978 it was suggested that a 2nd team be formed and the Vice-Captain to take charge, this was to be considered. From July 1978 the question of the brooches was raised, it would appear that Bettinsons would only make more if they had an order of at least 2 dozen. It was decided to find an alternative jeweller. July 1979 it was decided to order two dozen brooches at a cost of £9 each, silver with gold plate. increase the entry fee to £2. At the committee meeting March 1984 it was agreed that trophy winners pay for their own name to be engraved, and then present the invoice to the treasurer. Also at this meeting it was decided that the team sweater be navy blue with a badge, denoting the Lincoln Imp and LVLGA in gold. At the 1984 AGM it was suggested that the Autumn meeting be changed to a 4ball better ball over 18 holes. This was to be put to Mrs. Chaplin who had presented the trophy, to see if she had any objections. It was suggested by Mrs. Rita Blakeborough that the Captain be allowed to buy a team brooch, if she so wished. There were no objections. 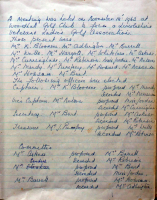 At the committee meeting in March 1985 the Autumn meeting was discussed and it was decided that it be played as a fourball betterball stableford and Mrs. Chaplin, who had provided the trophy, was pleased to go along with the new format. July 1986 it was decided to increase the gratuity given to clubs which hosted the Spring and Autumn meetings from£30 to £50. The 2nd team had played a match against Northants. but it was decided not arrange any further fixtures after the match in 1987 as it was considered not successful. July 1989 it was decided to keep a register of all ladies who play in County matches, secretary would keep the register. Also passed that brooches should be given free of charge. At the committee meeting in October 1989 it was suggested that after the election of officers at the AGM the new Captain should take the chair. This was agreed for the future. When we were hosts to the Senior men or County ladies, then the coffee and sandwiches would be paid for by the Association. At a committee meeting in March 1990 it was agreed that if a member lost her brooch, then she would have to pay for a replacement . At the June 1990 meeting, it was passed that the Treasurer and Secretary be presented with brooches as ' a thank- you' for their work on the committee. At the October 1990 meeting it was agreed to pay clubs £25 when matches were played on their courses. July 1991 it was reported that repair work was needed on the Nelson trophy and one of the candlesticks ( Chaplin Trophy) required replacing, also the plinth needed improvement. This work was agreed to and Mrs. Beryl Hix would be responsible for it. In June 1992 a prize table cloth for the 'Vets' was discussed. At the 29th AGM, November 1992 it was passed unanimously that the age limit be raised to 60yrs. but that members under 60 yrs. at present would not forfeit membership. also a small cloth for the raffle table. Everyone agreed that the cloth was magnificent. The materials had cost just less than £31 and Ann had not charged for her time or expertise. 'thank-you' from the Association, she chose engraved tumblers. entry to golf meetings. The AGM luncheon is extended to the Captain, Secretary and Treasurer. The County President and County Captain. Also the Midland Vets. Captain if she is from Lincolnshire. the Spring & Autumn meetings to £150. The honoraria for the Captain was increased to £25 in October. At a meeting in March 1998 it was suggested that we pay for our prizes rather than rely on donations, although they would still be gratefully received. To offset this extra expenditure the entry fee to competitions would have to rise. At the July meeting it was disclosed that the price of the team brooches had increased but as only a small number are presented at any one time, then the Association would continue to pay for them. March 1999 it was thought that the entry fees to the Spring & Autumn meetings should be increased to £15 in 2000. However, in October 1999 the increase would be £14. New plinths are needed for the Chaplin Trophies, as the silver band is full. Treasurer will obtain an estimate. In March 2000 it was suggested that the age limit be dropped to 58 yrs. from 60 yrs. The fact that ' Spring meeting' had 'Championship' preceding it meant that, as far as LGU was concerned it would be a qualifying competition, so the word, 'Championship' was removed from next year’s fixture list. New plinths and additional plates were made for both of the Chaplin Trophies in 2000 and they were both re-plated in 2001. The July 2000 meeting was advised by the County Handicap Adviser that the Association was deemed to be a private society and as such was not subject to qualification status for the Spring Meeting, so could use the word 'Championship'. as long as this stipulation was on the entry form, the association was within their rights not to award them their prize. The honoraria for the Captain, Secretary and Treasurer to be increased to £35 each at the meeting in October this year. At the 2000 AGM it was passed that the minimum age be dropped to 58yrs. but in 2001 if the maximum membership of 430, was reached, because of lowering the age limit, a ballot of the 58-59 age group would be held. can be circulated to clubs/members thus eliminating the necessity of reading out at the beginning of the meeting. At the October meeting it was decided to put a place on the agenda for the Vice Captain, so she can give details of 2nd. Team activities. The County Secretary invited two members of the Vets.to attend County Reps. meeting. Closing date for membership to be end of November each year to make administration easier. It was proposed to ask the Reps. to be in charge of running the Spring and Autumn meetings when they were in their area. As the post of secretary had been split into two positions, that of Secretary and Competition secretary both should get free entry into the Spring and Autumn meetings and the LVLGA luncheon. This was agreed at the August meeting. At the October meeting it was agreed that both the Secretary and Competition Secretary receive an honorarium. At the AGM we were honoured to have the company of one of the founder members, Mrs. Noreen Haryott, who celebrated her 100th birthday in September of this year. Jubilee Year! A celebratory competition to be held at Woodhall Spa Golf Club on 3rd. June followed by a meal. The Association has had a good first fifty years; there is no reason why it shouldn't continue to grow on its success. Members as at April 2013 number 395. The first team play against four other counties, Nottinghamshire, Leicestershire, Northamptonshire and Norfolk. The second team play against two other counties, Nottinghamshire and Leicestershire. The matches are well supported and are very much enjoyed. Members from approx. 26 county clubs represent the Association in these matches. To view information and photographs of the Association on line visit the County website at www.lincolnshireladiesgolf.co.uk we have our own ‘drop down’ menu along the top bar and this leads to an information menu on the left hand side. ORIGINAL RULES AND CONSTITUTION OF THE LINCOLNSHIRE VETERAN LADIES GOLF ASSOCIATION. Management - The Association shall be managed by a committee consisting of a Captain, Vice-Captain, Honorary Secretary and Treasurer and not more than three elected members and the retiring Captain to hold office for two years after which they may offer themselves for re-election. The retiring Captain shall be automatically a member of the committee for a two year period following her retirement. Meetings - The Annual General Meeting shall be held in November. c) To elect Captain and Vice-Captain who have been nominated by the committee. d) To elect Hon. Secretary and Treasurer. e) To elect not more than three members for the committee. f) To decide future events. Subscriptions - the annual subscription to be 2/6d per member. Due January 1st. each year. General Decisions concerning all competitions and team events, allocation of prizes, sweeps, ties and all other details shall be made by the Committee. Rules of theGame - the rules of the game shall be the current ones published by the R & A. That the committee should consist of eight members with power to co-opt any member to stand for one year. Also that any committee member who has served for two years shall not be eligible for re-election until one year has elapsed. Subscriptions changed periodically to keep in line with inflation, as in 2013 membership is £5 and renewal is £3. In 1974 there was an amended constitution ( yet to be found). Copyright © Lincolnshire Women’s Golf Association, 2016-2019. All Rights Reserved.